I've got this pattern and technique from a book. 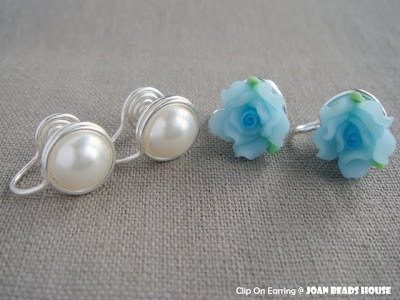 A clip on earring made by cooper wire, which is suitable to those who have no earring hole or with sensitive skin. 这个款式和技巧是从书上学来的。用铜线拗成的夹式耳环，非常适合没有耳洞或容易敏感的人。 Side view. 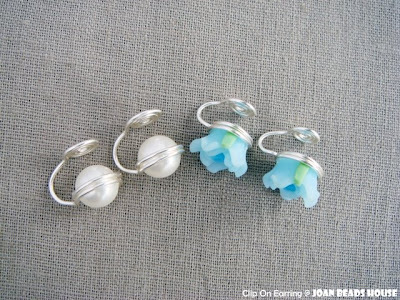 techniques to make these 2 pairs of earring is quite different due to the shape of beads, which the back of pearls are round, whereas the back of rose beads are flat. I'll wearing this earring for whole day long to test for its durability, stay tuned for the result.